In nineteenth-century Cincinnati, fourteen-year-old Tim Allerton finds his anti-slavery views tested when he and his younger sister Pam save the life of a slave baby whose mother has recently been murdered. - Publisher At school, Hollis Bodley tries to outdo Tim in everything and openly makes fun of Tim's anti-slavery views. At home, Tim's father constantly reminds him to keep his opinions to himself because their family business depends on customers from the South. Pam, Tim's younger sister, doesn't understand why he has a problem with slavery in the first place. "Slaves are treated just like family," she says. Then Tim and Pam are put into a situation where they can save the life of a slave baby whose mother has just been killed. Will Pam change her views on slavery...or will she continue to ignore the problem? And when a move to drive black people out of the section of the city called "Little Africa" puts Tims's good friend Ward Baker in danger, how can he help? - Publisher History comes alive for eight-to-twelve year olds in this close-up, fun-to-read, multi-generational story of a fictional family spanning three centuries of actual historical events. God's hand is seen at work in people's lives and in the events that shaped our nation. 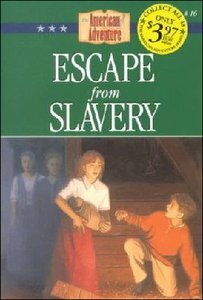 About "Escape From Slavery (#16 in American Adventure Series)"
At school, Hollis Bodley tries to outdo Tim in everything and openly makes fun of Tim's anti-slavery views. At home, Tim's father constantly reminds him to keep his opinions to himself because their family business depends on customers from the South. Pam, Tim's younger sister, doesn't understand why he has a problem with slavery in the first place. "Slaves are treated just like family," she says. Then Tim and Pam are put into a situation where they can save the life of a slave baby whose mother has just been killed. Will Pam change her views on slavery...or will she continue to ignore the problem? And when a move to drive black people out of the section of the city called "Little Africa" puts Tims's good friend Ward Baker in danger, how can he help? Norma Jean Lutz is a speaker, writing teacher, and author of more than two dozen books. She lives in Tulsa, Oklahoma.